Today I found an odd packaging in a supermarket. 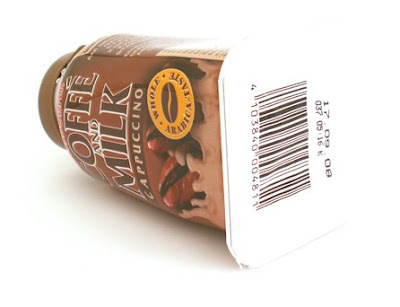 The Elsdorfer coffee and milk is an ice coffee which is packaged in a bottle with a foil bottom. So why is that packaging wierd. It's odd because of the foil bottom and because under the cap itself is also a foil. The foil on the bottom is actually making the package very vulnerable to sharp object that can easily pierce through it, I could actually pierce open the bottom with my hands so it doesn't really protect it that much. For what I can see is that they use this process so they can fill it up from the bottom, but they could had filled it from the top instead and use a bottle with a normal closed plastic bottom. Because I can see that this package cost more because of the odd bottom. They need to use more machines to produce this bottle and use more different materials. And the graphics are not directly printed, so that is not why they would use this design because it's just a shrink wrap. Also you can't easily remove the foil on the bottom, you can pierce it with something, but you might spill some by doing that. Maybe it's an idea to be possible to open the bottom so you can think it like from a cup instead of the small hole on top. 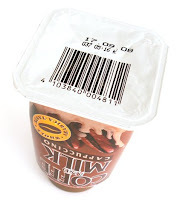 And if you have noticed they did a big no no, they put the barcode on the bottom instead of on one of the sides. The taste isn't really that great compared with the Nestle Nescafe that I drunk in Hong Kong. Also it's very thick coffee. On the info it says it got the double strength of the normal coffee. Maybe an idea for drinks or beverage companies this is a bad everyday bottle packaging. Unless you want to make it possible to make a Popsicle from your favorite beverage. If you know Danone yogurt desert for children they had a great package design, a simple plastic cup with and foil that sealed the desert. But the desert is not only just normal yogurt, they actually provide a stick which you can stick through the foil and put it into a freezer. Then you will automatically change your yogurt into a yogurt popsicle.